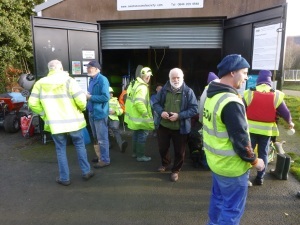 The day was slightly overcast but the temperature was quite mild as we gathered at the Boat Depot in Coed Gwilym Park. Perfect working weather! Gordon set up the mixer in preparation. Our goal this week was to continue with the re-building of the canal bank on the towpath side running north towards Trebanos. Doing the mix this week we had the two Gareths. 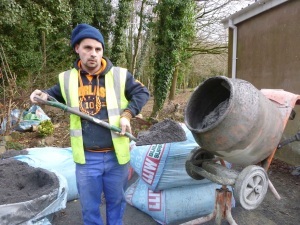 Gareth junior was shovelling the stone dust and cement into the mixer. The correct ratio is quite critical at this stage, and he is an old pro at this game. Gareth senior was adding the appropriate amount of water to get a perfect consistency. The mix is then taken down to the work site using the powered barrow. As well as the mix, we also need the stones. 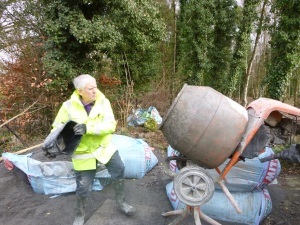 Again, the barrow is used to bring stone down to the work site. As we progress with this canal bank repair our supply line from the mixer becomes extended. The powered barrow has proved to be a most useful bit of kit. As the stones were being set into the cement the pointing has to be painstakingly carried out. The photo shows volunteer Sue putting the final touches to this week’s work. 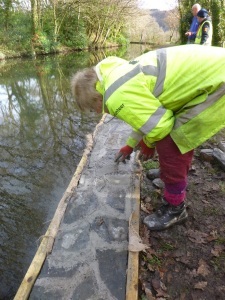 In total, this work party filled and laid twentyfive sand bags of stone dust and cement to form a footing and then, using wooden shuttering, built five metres of attractive stone wall along the canal. 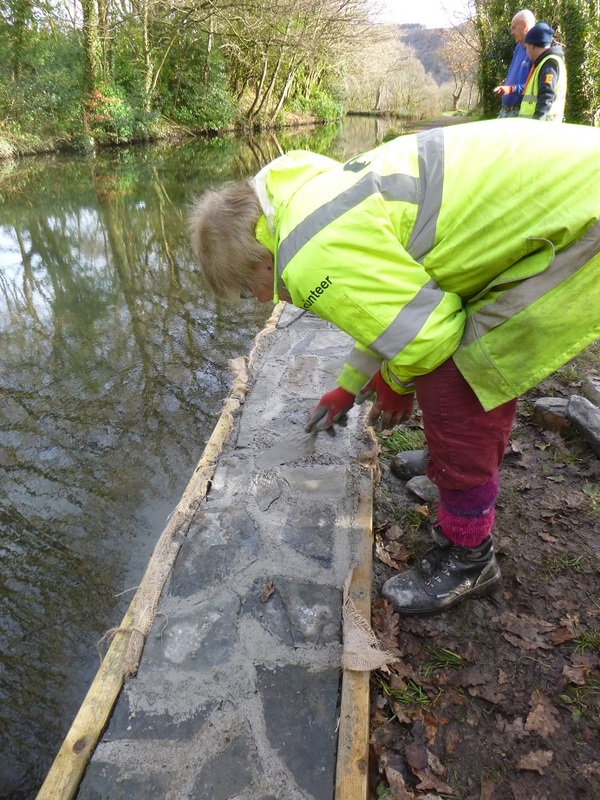 This work will improve the structure of the canal bank and will last for many years. It was time for tea and coffee back at the Boat House in the park, and everybody gathered for a chat and a slice of homemade cake. Also this week, Gill and Michelle leaped into a Canadian canoe and headed up the canal towards Trebanos to investigate reports of a tree down in the canal. The tree was found near the riding stables just ‘south’ of the Trebanos Locks. The size of the tree was more than a match for simple hand saws, and a decision was made to leave the tree for now and go back to it another time. 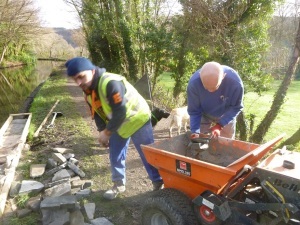 We also had Mike doing sterling work with his trusty ‘litter picker’ and David was busy cutting back over-hanging branches to keep the towpath safe for all users. 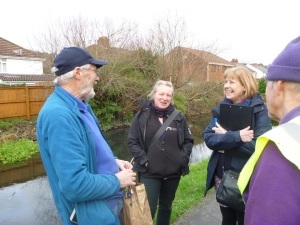 This week we had a welcome visit by two members of Canal & River Trust team. The photo shows Martin Davies talking to Oda, the environmental adviser, and on the right, Caroline the volunteer co-ordinator for the CRT. They came down to catch up with what we are doing and to offer helpful advice. Martin also met with Peter and Margaret from the Watford Industrial Society to plan their visit in September. The group plans to visit several historical sites in and around Swansea. Clive Reed, our Heritage Consultant, will talk to the group before they tour the canal in Clydach, Trebanos and Pontardawe. Martin roped them and Brian into the tedious task of folding information leaflets. 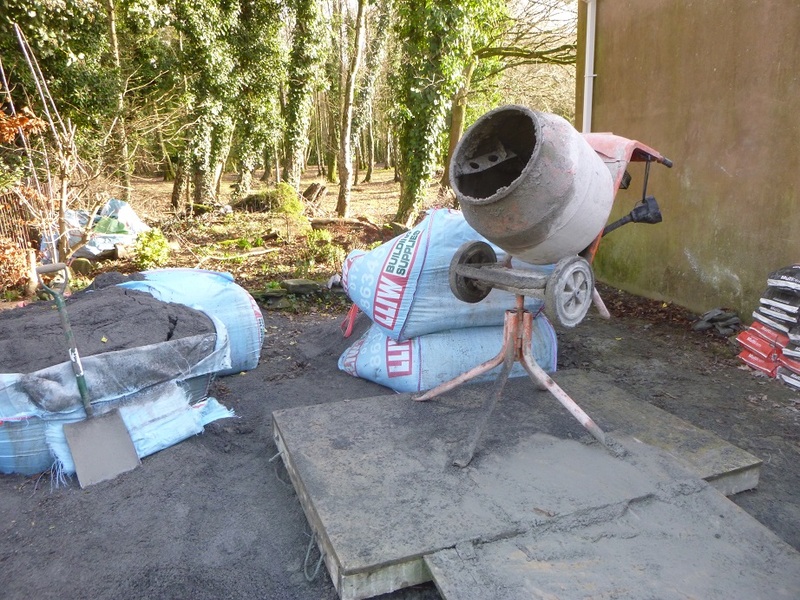 It was a very productive working party this week with a wide variety of tasks being carried out.